The way we save for our long-term financial needs may not see the sea change we expected when the Union government had announced the Original Direct Taxes Code (ODTC) Bill proposals in August 2009. 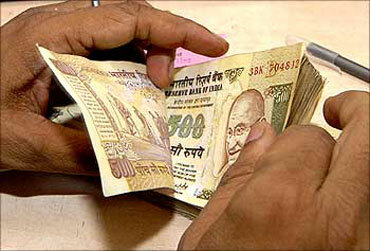 The new code will eventually replace the Income Tax Act, 1961. The revised proposals of the DTC, released recently by the finance ministry, paint a somewhat different picture for the taxpayers. Though clarity on various aspects is still some way off, let's take a look at the impact of the Revised DTC (RDTC). 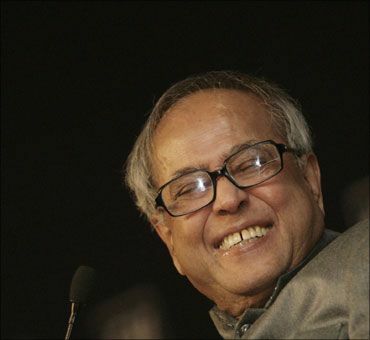 Original DTC: While the RDTC Bill has not proposed anything adventurous -- unlike the ODTC Bill -- it still has provisions for tax-saving investments, with the limit staying put at Rs 3 lakh (Rs 300,000) per annum under Section 66 of the proposed DTC. According to the ODTC, you would have been allowed to invest only in accounts maintained by any of the four permitted intermediaries -- provident funds, superannuation funds, life insurers and the New Pension System (NPS) -- and claim tax exemption at the contribution stage. Any accretions were tax exempt, but withdrawals or maturity proceeds were to be taxed. Revised DTC: Under RDTC, the Public Provident Fund (PPF), Employees' Provident Fund (EPF) or any other provident fund proceeds continue to be tax-free. In addition, NPS, proceeds of pure life insurance products and annuity products, too, would be tax-free and get the EEE (exempt-exempt-exempt) status for taxation, i.e., exemption in the year of contribution, during the period of investment and at the time of maturity. This should give pension products a reason to shine brightly in one's financial portfolio. The revised draft aims to harmonise all savings products based on their holding period and boost long-term savings. It says: "To achieve the objective of long-term savings, the rules for contribution, as well as withdrawal, will be harmonised and made uniform so that such savings are actually made and utilised by the taxpayer for the long term." This implies that insurance products, such as endowment, moneyback or Ulips, move into the exempt-exempt-taxable (EET) regime. However, there isn't enough clarity on this. The revised proposals have brought about clarity as far as existing investments are concerned. The draft says that investments made before the date of commencement of the DTC in instruments which enjoy the EEE method of taxation under the current law would continue to be treated in the same way for their full duration. Original DTC: Under the ODTC, employees were supposed to put all their retirement benefits, such as gratuity or VRS proceeds, in a retirement benefit account (RBA) with any of the four permitted savings intermediaries to avail tax exemption. Any withdrawal would have been taxed. Revised DTC: Under the RDTC, the concept of RBA itself has been scrapped. All retirement benefits continue to be exempt, subject to limits. In the table above: Deduction at a specified percentage of capital gains. To qualify as long term, the period has to be more than a year from the end of the financial year in which asset was acquired. Original DTC: As of now, if you have a second property, even if its lying vacant, it is taxed under the premise of being 'deemed to be on rent'. The basis of the tax is the notional rent. Those who have not rented it out still have to pay the tax. The ODTC suggested its taxation would be based on the gross rental income, which would be higher of the actual rent or a presumptive rent of 6 per cent of the value as set by the authorities. Revised DTC: RDTC allows the gross rent to be the actual rent received. So, if a property which is not actually rented out and is vacant, the gross rent will be nil and the owner wouldn't have to pay any tax. However, if the house property is self-occupied, you will be eligible for annual deduction on account of the interest on the capital borrowed for its acquisition or construction, subject to a ceiling of Rs 1.5 lakh (Rs 150,000) a year, from the gross total income. This comes a big relief for several home loan takers. 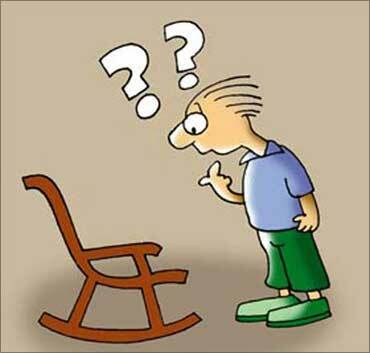 Original DTC: The DTC does not distinguish between short- and long-term capital gains. Currently, if you sell units of equity-oriented mutual funds after a year, you don't need to pay any capital gains tax. But as per the original direct tax code proposals, you would need to pay tax when you sell your MFs -- be it equity or debt. 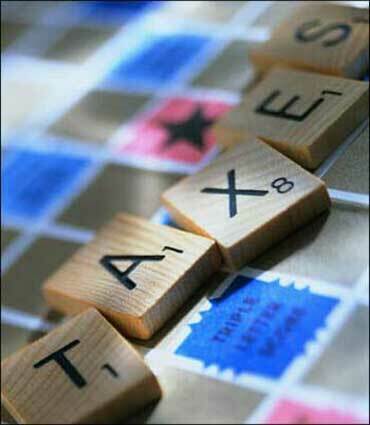 The gains get added to your income and taxed as per your income slab. However, in case of gains made above one year, the code will allow you an indexation benefit. Indexation is a facility offered by the income-tax laws to adjust your security's cost price for inflation over the years. This enables you to inflate your cost price in order to reduce the difference between your selling price and cost price. The lower this difference, the lower is your tax liability. For investments such as gold, gold ETFs and real estate less than one year-old, the capital gains will be added to the taxable income while those more than a year old will see the gains getting adding to the taxable income after adjusting for indexation benefit. Revised DTC: On long-term capital gains (LTCG) on equity shares and equity funds, the RTDC removes the indexation benefit. Instead, it introduces a concept of certain specified deduction from the capital gains, depending on the holding period of the investment. Once the gains are reduced after deducting a percentage, it gets added to your income and, then, taxed as per the slab. What if one is holding units of MFs or listed equity shares for a long period? Selling them in post-DTC era would surely call for tax. The natural instinct will be to sell them before the D-day of 1 April 2011 and, then, maybe buy it again the next day. The government is aware of this and, so, as per the revised draft, it says: "As there will be a shift from nil rate of tax on listed equity shares and units of equity oriented funds held for more than one year, an appropriate transition regime will be provided, if required." On short-term capital gains, there will be no indexation and deduction benefits and all gains will be added to income and taxed accordingly. So, instead of the current 15 per cent applicable for all, lower tax-slab individuals stand to gain by paying 10 per cent under the new DTC rules. The concept of holding period is the second big change proposed. At present, holding the capital asset for 365 days or more qualifies it as long-term. As per RDTC, capital asset held for a period of more than a year from the end of financial year in which it was acquired will qualify as long-term. This period may go up to 730 days now. 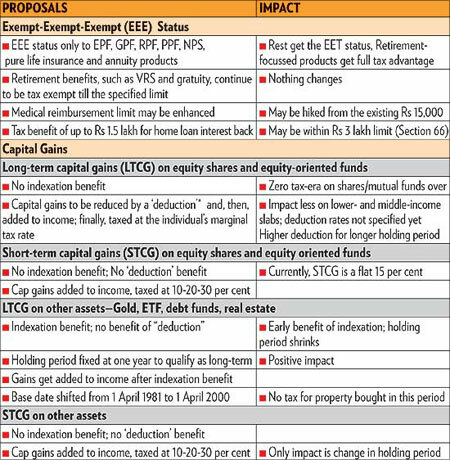 LTCG on other assets: On LTCG on all other capital assets other than shares and equity funds, i.e., gold, real estate, debt funds and ETFs, there won't be any benefit of specified deduction. Here, the time period for qualifying as an asset as long-term has been reduced from three years to one year. The gains will get indexation benefit. STCG on other assets: On short-term gains from such assets, gains will be added to income fully, without deduction or indexation benefit.